Shop seasonal this fall! Winter squash is available from August through March; however, they are at their best from October to November when they are in season. 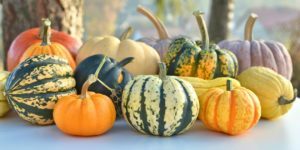 Winter squash, members of the Cucurbitaceae family and relatives of both the melon and the cucumber, come in many different varieties. While each type varies in shape, color, size and flavor, they all share some common characteristics. Their shells are hard and difficult to pierce, enabling them to have long storage periods between one and six months. Their flesh is mildly sweet in flavor and finely grained in texture. Additionally, all have seed-containing hollow inner cavities. Winter squash are also rich in a variety of vitamins and minerals. It is a great source of Vitamin A in the form of beta-carotene which has powerful antioxidant and anti-inflammatory properties. Beta-carotene is able to prevent the oxidation of cholesterol in the body. Since oxidized cholesterol is the type that builds up in blood vessel walls and contributes to the risk of heart attack and stroke, getting extra beta-carotene in the diet may help to prevent the progression of atherosclerosis. Winter squash is also an excellent source of Vitamin C, potassium, dietary fiber and manganese. Potassium may help lower blood pressure and Vitamin C is known for its ability to strengthen the immune system. In addition, dietary fiber is significant in helping lower bad (LDL) and total cholesterol. Tips on how to prepare winter squash: After washing winter squash, cut it in half and remove the seeds and fibrous material in the cavity. Depending upon the recipe preparation, you can either use it peeled or unpeeled. Alternatively, pierce the squash near the stem with a knife to allow any steam to escape, then bake in a 350°F (175°C) oven for 45 minutes to an hour, until a knife can be easily inserted near the stem. As you would before carving a pumpkin, cut out a small circle around the stem, remove this piece from the squash, and scoop out the seeds and fibrous material in the cavity. Next Post Cheese and Football! What’s not to love?